Re: My biggest buck yet and I'm 8 months pregnant! 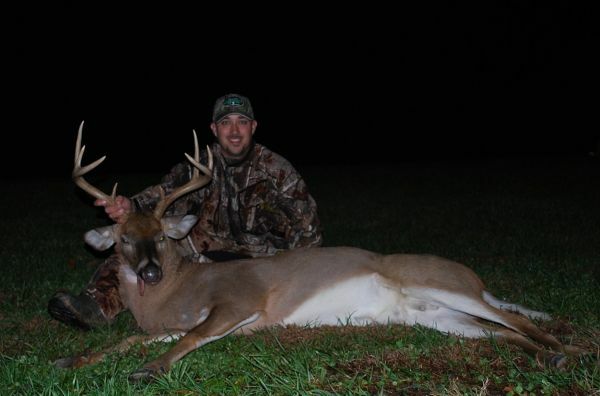 in response to a report titled: My biggest buck yet and I\'m 8 months pregnant! 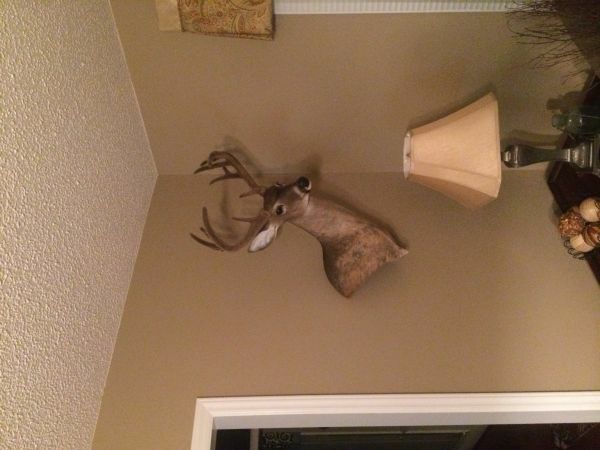 Finally got my mount back. My taxi takes his time and always does a great job. Killed this Main Frame 10 on opening day. Been after him for three years. Taxidermist aged him between 7.5-9.5 looking at his jaw bone. Rattled in this 8pt on the Wed. before Thanksgiving. It was my biggest buck to date. I shot this deer on Sept 12th with a bow, but never found him until this morning (12/24). He went in a thick cutover and wasn't able to get in real good until after the leaves and foilage was gone. Glad to finally have some closure with this buck. My biggest to date. I shot this buck on September 12th and I lost is blood trail in a Very Thick cutover. Never gave up the search and went back today and found him! Glad to fnally get the closure on this deer I named 'Double D'. Dobule Droptine buck that I've named 'Double D', obviously. 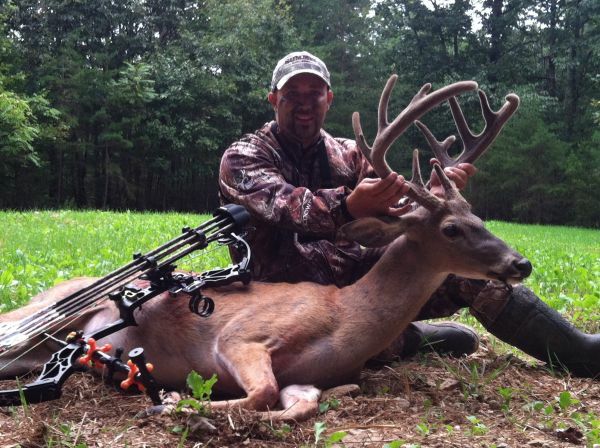 Here is a double droptine buck that I will be after come Sept 10th. Here is my fan, wings, and beard mount for my Erythricitic color phased 3 bearded gobbler I killed this year. Well, it was another successful turkey season for me. Last year i was able to tag out in NC (2) and VA (3). This year I was able to tag out in NC and come up one short in VA.
My first turkey of the year came just minutes in on opening day. I was with my two hunting buddies, Rick and Rich, and we were all set up in my Double Bull blind. Rick was up first with the bow, and I was the backup man with the scatter gun. Rick had roosted the bird the night before on a new piece of property. He flew into the field and slowly made his way to the decoys. With the bird in full strut at about 15 yards Rick drew back his Hoyt bow and let it fly, but he shot a little left and knocked a few feathers out. The bird ran a little way and stopped and I was able to fill my first tag and start the season out right. The longbeard had a 10 1/4' beard and 1 1/4' spurs. My 2nd NC turkey came during the last week of the season. My 4 year old was playing on the deck when she came in the house and told me, 'Daddy, there's a turkey making turkey noises behind the house!'. I immediately got up (just moved here and haven't heard one all year) and went out back and hooted at him, and sure enough he sounded off. Got in on him early the next morning and he was roosted aobut 75 yards from my setup. He flew down and came right to me and my hen decoy. I was back at the house by 6:30 that morning. 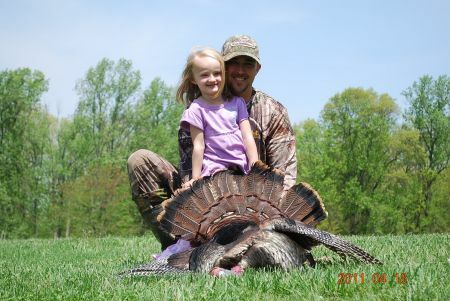 Come to find out that this turkey was indeed a ver rare erythcitc color phased gobbler. The rarest color phase of the eastern species. I had no Idea what I had killed at the time and went ahead a breasted it out. After I found out what i killed I was mad that I didn't get him mounted. He had 3 beards, 11' 2.5' 1.5' and 1' spurs. Those were my 2 NC birds. A comment titled: Re: My biggest buck yet and I'm 8 months pregnant! in response to a report titled: My biggest buck yet and I'm 8 months pregnant! That's Awesome! And big props to your Husband giving up opening day for you! Not sure why they are sideways. They aren't like that on file on the computer. A comment titled: Youth Season in response to a report titled: YOUTH DAY QUESTIONS?????? Actually, the law states that a person Under the age of 16 is considered a youth. So in reality, it's 15 and under. Every stand I put up has a life line in it. I'm attached from the time I leave the ground til the time I arrive back. I have a family that is counting on me retuning home safely. A comment titled: Sorry in response to a report titled: Guess u never know what bucks can grow to!! Missed the part where you said he looks as if hes blind....that's a huge jump from one year to the next. Congrats Man! Nothing like killing them with a bow! A comment titled: How do you know? in response to a report titled: Guess u never know what bucks can grow to!! Just curious, but how do you know that's the same deer? That's alot of growing in one year. 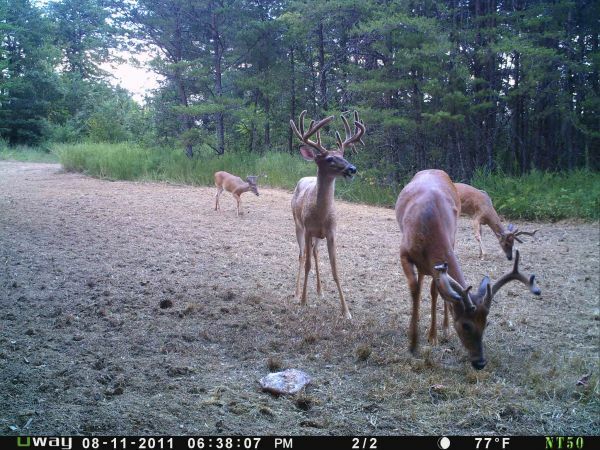 Is there certain characteristics that make you believe its the same deer? Alot of times you can tell by markings on a deer or something to that. Not saying it's not, but just want to hear opinion or something that backs it up. Congrats to Jackson! Something was telling me I should have kept my camera up behind the house!! Awesome deer for his first buck! A comment titled: Ball in response to a report titled: What do you think is in this game camera pic? My guess on the ball is a water spot on the lens. I agree with GT that the lights are bugs. A comment titled: athens bow in response to a report titled: Opening Day Monarch!!! Absolutely love the Athens Bow and their company. My sight is actually a Sword Sight and I love it. I have owned both sword and HHA and can't say a bad thing about either of them. A comment titled: Bow in response to a report titled: Opening Day Monarch!!! It is an Athens Bow...the Recluse. Its a vendetta T-bar stabilizer. Got 3 vibration dampeners on them. He laid out there for over 3 months. He had a little bit of velvet on the bases of his horns. He was mostly hard-horned. The rack is still in good shape. No critters got to him. No I didn't share the story of the hunt because I was so down about the whole hunt. I posted some trail cam pictures of him from the summer on here. I watched him all summer and he came in at 6:30 on Monday September 12th. I tracked him for about 200 yards and lost the blood trail. He went into a thick cutover that was hard to even walk through. The picture is very decieving. I promise that is the correct score. And yes, I am very ready to chase some longbeards!! Hey Tom, between me and my 2 buddies I think we got 7 or 8 kills on film. Very successful season. Hope to get Double D on film! Yes, they have been hitting it pretty hard and digging around it. It's actually in my unfinished basement, but I can't win to get one upstairs. I chose my battles, and this one is not worth fighting. 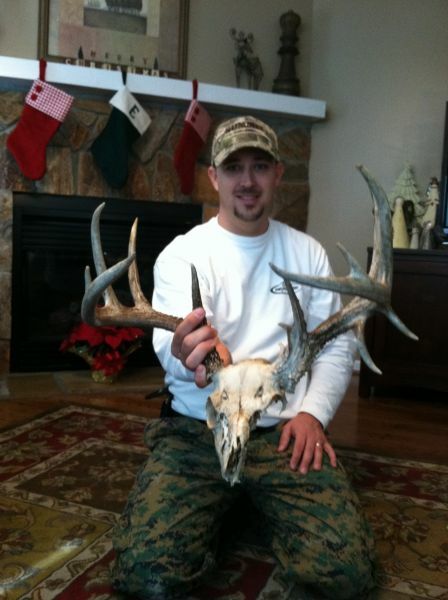 Great looking mount! 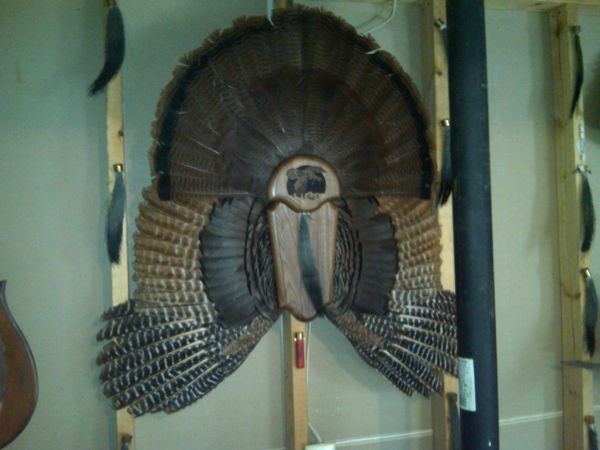 I am getting the same one done on my Erythrcitic color phased turkey I killed. Hopefully it will look as good as yours! I live in King, NC and I am a PE teacher and I coach Varsity Girls Basketball and Varsity Baseball @ South Stokes High School. 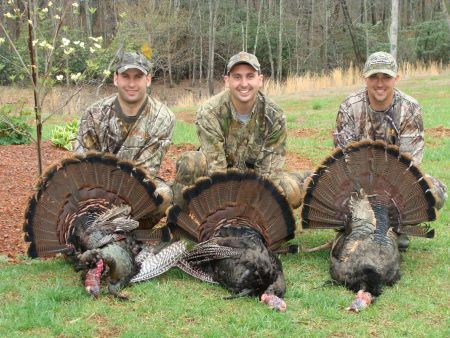 I love to hunt and fish and my passion is Turkey Hunting.